Susan D. (Moore) Brown, PhD, is a Research Scientist I and licensed clinical psychologist at the Kaiser Permanente Northern California Division of Research. Her research focuses on health behavior change for chronic disease prevention, particularly among racial and ethnic minority groups. She has directed weight management lifestyle interventions for several federally funded trials and examines patient engagement, program effectiveness, and implementation-related issues. 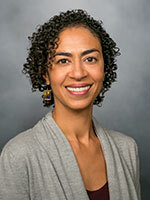 Her interests in minority health extend to ethnic identity and minority recruitment to clinical trials. Dr. Brown has received a Mentored Research Scientist Development Award (K01) from the National Institute of Diabetes and Digestive and Kidney Diseases to examine patient engagement in diabetes prevention programs, as well as support from the National Institute on Minority Health and Health Disparities Loan Repayment Program. Dr. Brown completed her undergraduate degree at Duke University and doctorate in clinical psychology at Boston University. Prior to joining the Division of Research in 2010, she completed predoctoral clinical training at the San Francisco Veterans Affairs Medical Center and a postdoctoral research fellowship in cardiovascular disease prevention at the Stanford Prevention Research Center in the Stanford University School of Medicine. While lifestyle programs to prevent type 2 diabetes are increasingly available, the drivers of patient engagement in them remain poorly understood. This study aims to identify characteristics of patient subgroups at risk for poor engagement, providing a basis for future targeted outreach efforts among women with a history of gestational diabetes. The potential for efficacious lifestyle interventions to prevent type 2 diabetes hinges on patient engagement in real-world healthcare settings. Yet patient engagement strategies are suboptimal and attrition is often highparticularly concerning for ethnic minority women who bear disproportionate burdens of diabetes and diabetes risk factors and may be less likely to utilize evidence-based approaches to lifestyle change. The training objectives of this career development award are to strengthen expertise in diabetes, implementation science, health disparities, and biostatistics. The research objectives are to experimentally test feasible, theory-driven strategies to increase engagement in diabetes prevention programs among minority women at high risk for diabetes. These strategies will incorporate tailored diabetes risk information and basic psychosocial science (e.g., self-affirmation theory) to promote translation of diabetes prevention programs in a practice setting. Contemp Clin Trials. 2012 Jul;33(4):620-3. Epub 2012 Mar 16. Acad Med. 2019 Jan 14. Int J Obes (Lond). 2013 Dec;37(12):1597-602. Epub 2013-04-16. J Consult Clin Psychol. 2013 Apr;81(2):336-46. Epub 2012-10-29. ​Obesity (Silver Spring). 2012 Apr;20(4):756-64. doi: 10.1038/oby.2011.293. Epub 2011 Oct 13. ​Eat Behav. 2011 Jan;12(1):60-3. doi: 10.1016/j.eatbeh.2010.08.007. Epub 2010 Sep 21. ​J Clin Psychol. 2009 Sep;65(9):971-88. doi: 10.1002/jclp.20600.